Old Maggie McGillicuddy has an eye for trouble, and that's why she is always on alert for whatever might happen in the neighborhood. Is that cat actually a fierce tiger? And isn't really that tree's root a dangerous snake? But one Saturday Charlie, her new neighbor, is certainly running straight for trouble! Chasing his ball, Charlie didn't realize a car is coming up the street. 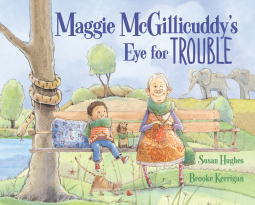 Thankfully Maggie McGillicuddy has always an eye for trouble! She shouts to Charlie making him stop. From that moment Charlie and Mrs. Gullicuddy start spending time together, always having an eye for trouble: an elephant stampede,a hungry crocodile, a UFO. After all, one never knows how much trouble might happen in this very street. How not to like Mrs. McGillicuddy? She is very nosy, it's true, but she is also friendly and incredibly imaginative, and Charlie enjoys her company. I think it is a great idea to bring the kids attention to the fact that elderly people can be cool too. Entertaining story that vividly dialogs with the reader. I find the illustrations absolutely catch the essence of the story. I kept wanting to know more Mrs. M and Charlie adventures.